Ageing: in traditional oak barriques of Slavonia for 4 to 5 years. Refinement: in bottle for one year. Organoleptic characteristics: this cru it is obtained a Barolo of great structure with elegance and complexity. In the nose it is initially fruity, then floral, then spiced, opened and intense. Generally of exceptional attitude for ageing. Gastronomic pairings: red meats generally, grilled fish or raw crustaceans, grilled white meats, hard cheeses or seasoned cheeses, chocolate, meditation. "Wine Spectator" has rated the wine "Cavallotto Bricco Boschis Vigna San Giuseppe, Barolo Riserva DOCG, Italy" from the vintage 2012 on 28.02.2017 with 97 of 100 points. "Wine & Spirits Magazine" has rated the wine "Cavallotto Bricco Boschis Vigna San Giuseppe, Barolo Riserva DOCG, Italy" from the vintage 2012 on 01.12.2016 with 95 of 100 points. "Falstaff Magazin" has rated the wine "Cavallotto Bricco Boschis Vigna San Giuseppe, Barolo Riserva DOCG, Italy" from the vintage 2012 on 25.11.2016 with 97 of 100 points. "Wine Enthusiast" has rated the wine "Cavallotto Bricco Boschis Vigna San Giuseppe, Barolo Riserva DOCG, Italy" from the vintage 2012 on 10.01.2016 with 93 of 100 points. "Luca Gardini" has rated the wine "Cavallotto Bricco Boschis Vigna San Giuseppe, Barolo Riserva DOCG, Italy" from the vintage 2009 on 01.07.2015 with 91 of 100 points. 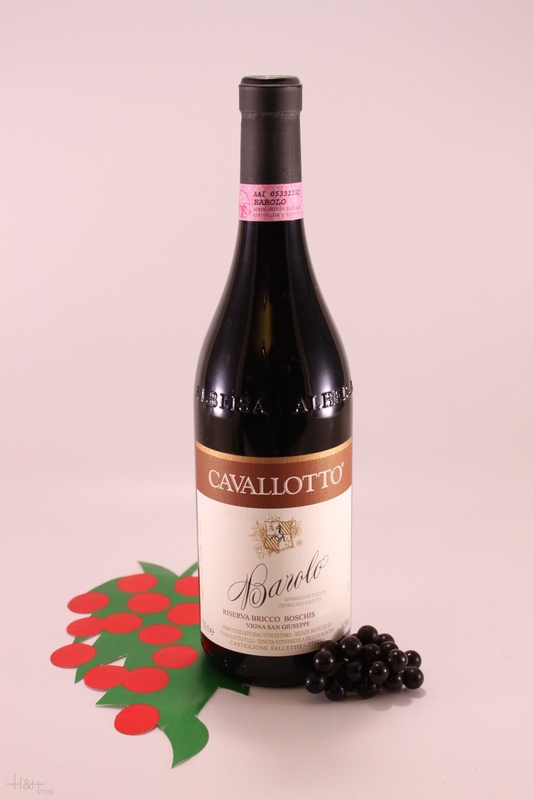 "Robert Parker The Wine Advocate" has rated the wine "Cavallotto Bricco Boschis Vigna San Giuseppe, Barolo Riserva DOCG, Italy" from the vintage 2009 on 29.06.2015 with 95 of 100 points. "Wine Spectator" has rated the wine "Cavallotto Bricco Boschis Vigna San Giuseppe, Barolo Riserva DOCG, Italy" from the vintage 2008 on 30.04.2015 with 94 of 100 points. "Falstaff Magazin" has rated the wine "Cavallotto Bricco Boschis Vigna San Giuseppe, Barolo Riserva DOCG, Italy" from the vintage 2008 on 21.11.2014 with 95 of 100 points. "Luca Gardini" has rated the wine "Cavallotto Bricco Boschis Vigna San Giuseppe, Barolo Riserva DOCG, Italy" from the vintage 2008 on 01.07.2014 with 94 of 100 points. "Huon Hooke" has rated the wine "Cavallotto Bricco Boschis Vigna San Giuseppe, Barolo Riserva DOCG, Italy" from the vintage 2007 on 20.05.2014 with 95 of 100 points. "Huon Hooke" has rated the wine "Cavallotto Bricco Boschis Vigna San Giuseppe, Barolo Riserva DOCG, Italy" from the vintage 2008 on 15.05.2014 with 84 of 100 points. "Huon Hooke" has rated the wine "Cavallotto Bricco Boschis Vigna San Giuseppe, Barolo Riserva DOCG, Italy" from the vintage 2001 on 12.05.2014 with 96 of 100 points. "Falstaff Magazin" has rated the wine "Cavallotto Bricco Boschis Vigna San Giuseppe, Barolo Riserva DOCG, Italy" from the vintage 2007 on 22.11.2013 with 95 of 100 points. "Wine Spectator" has rated the wine "Cavallotto Bricco Boschis Vigna San Giuseppe, Barolo Riserva DOCG, Italy" from the vintage 2006 on 30.09.2013 with 92 of 100 points. "Wine Spectator" has rated the wine "Cavallotto Bricco Boschis Vigna San Giuseppe, Barolo Riserva DOCG, Italy" from the vintage 2005 on 30.09.2013 with 91 of 100 points.